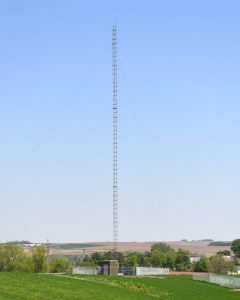 The Clarkson Wireless tower was constructed in December of 2016 and our wireless service was launched in May of 2017. The wireless internet service is transported on State of the Art Fiber Optic Cable, that was buried from our Stanton Telecom office in Stanton Nebraska to our tower in Clarkson. We have installed the newest generation of wireless equipment on our tower, which allows us to cover the city of Clarkson and also the surrounding countryside with great and reliable unlimited high speed internet. Over the years, we had received requests for service around the Clarkson area so we decided to go ahead with this project. We knew we would be able to provide a good, reliable internet service to the Clarkson area at a reasonable price. In 2009, Stanton Telecom upgraded their system to the latest cutting-edge internet technology by burying Fiber to the Home (FTTH) throughout their exchange. This fiber optic cable replaced the copper that was originally used for transporting service to all their customers. This state-of-the-art technology allows us to offer higher internet speeds and larger bandwidth to all customers. It also enhances their voice service and will eventually be used to carry IPTV (video over internet) to all their customers, including those in the country. In 2001, Stanton Telecom completed a 4 year project of fiber burial from their office to every pedestal in their exchange. This project was the first step in building their fiber optic network and eventually taking fiber to every house in their exchange. Stanton Telecom Inc. was first chartered as an independent telephone company on January 28, 1909. The name was Stanton Independent Telephone Company and was owned by H.J. Forbes and Harry D. Miller. On May 16,1951 the company was sold to R.G. and Maxine Deardorff. The Deardorffs changed the company name to Stanton Telephone Company, Inc. on March 27, 1979. On August 1, 1980, the company was purchased by Leona K. Paden and the late Bernard L. Paden. Robert J. Paden acquired interest in the company shortly afterward. Upon completion of the sale, the Padens began the undertaking of modernizing the Stanton Telephone Company facilities and operations.